Christian fundamentalism is toxic: Recent research in criminology demonstrates a strong correlation between high rates of violent crime and conservative Christianity. Of particular concern is “Christian Nationalism,” defined as a political ideology steeped in “a Christian right to rule,” and entailing a false revisionist history specifically focused on America’s founding fathers as devout Christians who did not believe in separation of church and state. This is not a coincidence…this belief system, and the culture it inspires, lends itself to many types of criminal activity including the promotion of violent crimes against a variety of victims, terrorism against those of different faiths, and even crimes against the environment. and the promulgation of laws, policies, and programs to address crime that stem from this belief system. Noting the violent biblical passages often cited by religious conservatives, their sense of righteousness, their dogmatic mindset that tolerates no dissent, and their support for harshly punitive measures toward “sinners,” Sparks shows that their worldview is the ideal seedbed for violence. 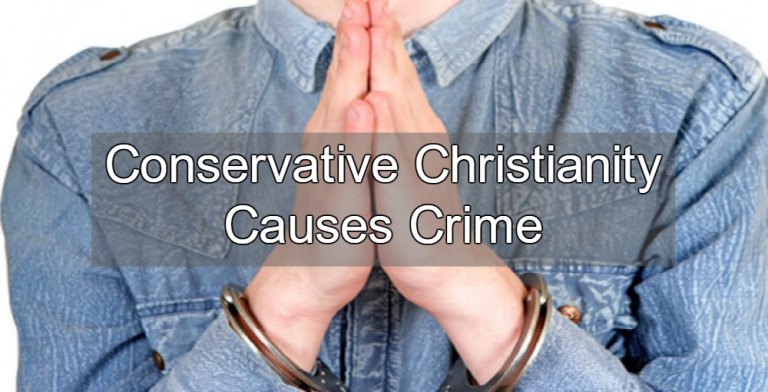 Bottom line: Conservative Christianity’s toxic mixture of fundamentalism, authoritarian politics, patriotism, and retributory justice actually causes crime. For more information on this topic see: The Devil You Know, the Surprising Link Between Conservative Christianity and Crime.